PlayGrand is an online casino for minimalists. The casino launched in 2015 and everything about it is succinct and to the point. Minimum withdrawal and deposit of £10 and no maximum withdrawal or deposit amount. 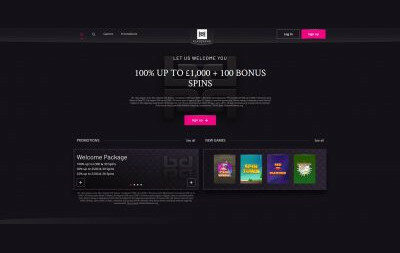 PlayGrand is managed by White Hat Gaming and licensed by the UK Gambling Commission and Malta Gaming Authority. While I like minimalism, I feel PlayGrand have taken it a bit too far with their layout. I like the colour scheme – magenta and dark purple – but you see more of that than the games or any writing. It just feels… unfinished? Navigation is easy; the games pages looks better, categorised by new games, top games, and different types (slots, jackpots, table games, live casino, and other games). You can also filter games by provider and order by most popular, and alphabetically (ascending and descending). If your favourite game is an obscure title, chances are you’ll find it and save yourself the trouble scrolling endlessly. The logo is nice and sleek – a wordmark in the style of an ambigram (reads the same if it’s upside down – a bit like 888). The concept is perfect for the design and helps with the minimal aesthetic. I just wish the main page was more inviting. PlayGrand offers the major payment methods including Visa, Mastercard, PayPal, bank transfer, Skrill, Neteller, and paysafecard. The minimum withdrawal amount is £10 and deposit amount is £10. There is no maximum withdrawal or deposit. For such a small-looking website, I was surprised to discover so many games. There are 1,300 to choose from in their extensive collection and some great titles are featured: Vikings, Berry Burst, Terminator 2, and Mega Moolah Isis are just some of them. As I mentioned earlier, PlayGrand has table games, live casino, and “other games” which is always interesting. The table games are standard fare with poker, blackjack, baccarat, roulette, and pontoon. Live casino has much of the same and those other games? Bingo, and football-themed games like Virtual Champions – like Championship Manager with virtual betting and you win money. And there’s a Loyalty Points scheme. Earn up to 2 points for every £10 you wager and redeem your points once you’ve accumulated 200 points. If you get 1000 points and redeem them all, you get a £5 bonus added to your account! PlayGrand is very much function over form. The barebones look put some players off, expecting grandiose imagery and flashy slogans but going minimal might be the way to stand out. After all, minimalism is all the rage right now thanks to ideas like KonMari. But the place where PlayGrand excels is the collection of games. There are 1,300 to choose from and that number is likely to increase with their top providers creating new games every month. You’ve never had it so good! There’s also the 24/7 live chat and e-mail support team and low minimum withdrawal and deposit amounts and no maximums meaning you won’t feel like your winnings are tied in. The welcome bonus does come with a 35x wagering requirement so if you’d prefer no wagering casinos, you might want to look elsewhere. But the loyalty scheme with its £5 bonus when you redeem 1000 points sounds enticing!